Today, I had an intense craving for spanish rice. I threw the following things into a pot and out came some of the most flavorful rice I've ever eaten! Bring water and vegetable broth to boil and then add all ingredients except tomatoes and lemon juice. Reduce heat and simmer for about 20 minutes. Add tomatoes and simmer for another 5 minutes. Remove from heat and allow to sit for about 10 minutes. Stir in lemon juice just before serving. 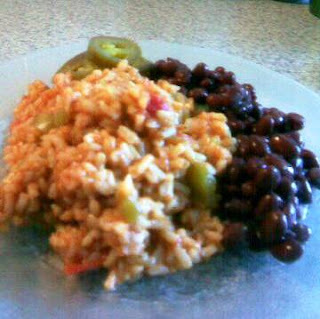 Lately, I'm into all things spicy, so I enjoyed mine with black beans and jalapenos!